A strong red coat with little white feet. She has pricked ears & they looked huge for her body when she was little. 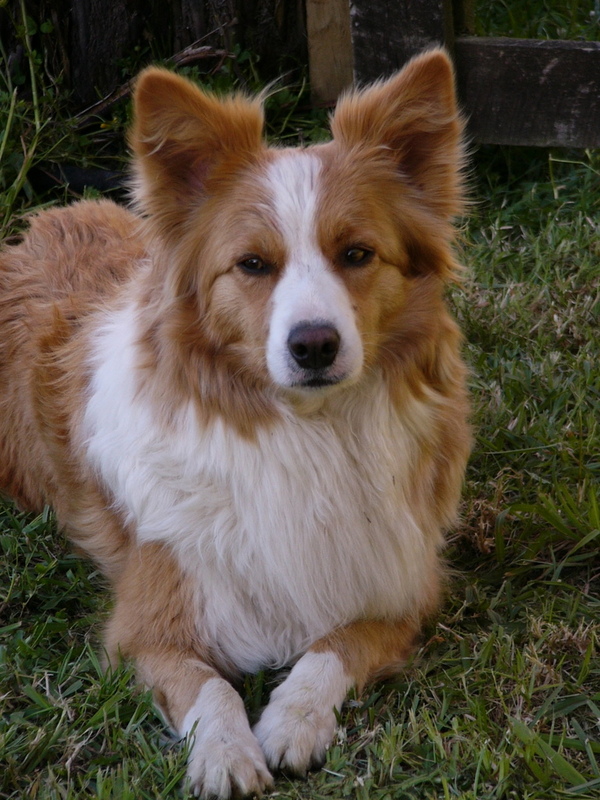 We call her Our Foxy lady because she is pretty & looks like a fox. She is a very good watch dog & normally the first to alert us to visitors. She was quite timid as a young pup but after lots of love & attention she is now pretty gutsy. She is still a little reserved with strangers but doesn’t take long to come round. The quietest of all our dogs & we enjoy that attribute in her. She is a real smooch & enjoys her cuddles. She is last up on the bed in the mornings for a cuddle & puts her head on your pillow & really snuggles in. She has quite a strong eye & loves to round up our sheep. Once in the yards she is very reluctant to leave them! When she was younger she would always find a way to get to us if we were doing anything to do with moving stock. She has a very determined streak in her!! She demolished & broke through the cat door one time when she was on heat in her attempt to come for a walk with us!! There was NO WAY she was going to be left behind. Maddie & Jasper had their first litter in September 04. Maddie was a wonderful mother & we had a great bunch of good looking pups. Maddie has been probably the best mother I could ask her. Her big litters (her biggest was 10) never go hungry & we only ever hear contented little purrs coming from them. She is quite happy to stay with them till they have all been fed. She is an absolute honey. I can confidently walk down the street & know Maddie will not leave my side. We kept two of her kids from her litter Oct 2009 with Hoons Shiraz & Moet but sadly we lost Moet. Shiraz is similar to Maddie but has a lot of her naughty father streaks in her too..
Maddie lived to a great age of nearly 16 years. DSS : WAYFARER MASTER EAGLE CDX.UDX. DS : ONE TO MANY OF LAPINEEK CDX. DSD : LADY CASS OF SHAMEILA CDX. D : MENTA OF HEIDESA CDX. DDS : OB.CH DAJARRA TROUBLES EDITION CDX. DD : JAZZ’S GIRL OF HEIDESA CDX. DDD : OB.CH JAZZLA DWANA CDX.